Very good overview of the band. I too was a bit skeptical when Alabama first arrived on the national scene in the late 1970’s. My radio station played their first national chart single “I Wanna Be With You Tonight” on GRT Records in 1977. Our Program Director was good friends with the Promotion Director at that label and wanted to give the new act a shot. It was not a bad song and had it been released a couple of years later it may have done better than it’s #78 chart position. Being a fan of the more traditional side of country music I was not enthused to see a new act that was a bit outside the lines of what constituted mainstream country music at that time. The past several years had already brought a proliferation of pop-influenced content to the country charts. Kenny Rogers, Ronnie Milsap, Eddie Rabbitt, Barbara Mandrell, Dolly Parton, Crystal Gayle & Anne Murray (to name a few) had all released highly-produced pop and/or R&B flavored songs that brought them success on top 40 radio as well as country stations. To me Alabama represented a further shift away from the center in another direction as their content, as well as their appearance, was definitely influenced by southern rock. Personally that musical style was not what I enjoyed hearing in the context of country music. But the times were a-changin’ and the younger end of the country audience that embraced Waylon & Willie’s outlaw music was also willing to accept Alabama. Their first RCA single “Tennessee River” included a fiddle breakdown perhaps in an effort to diminish resistance from programmers like myself that were not sure if the group would be accepted by mainstream country listeners. 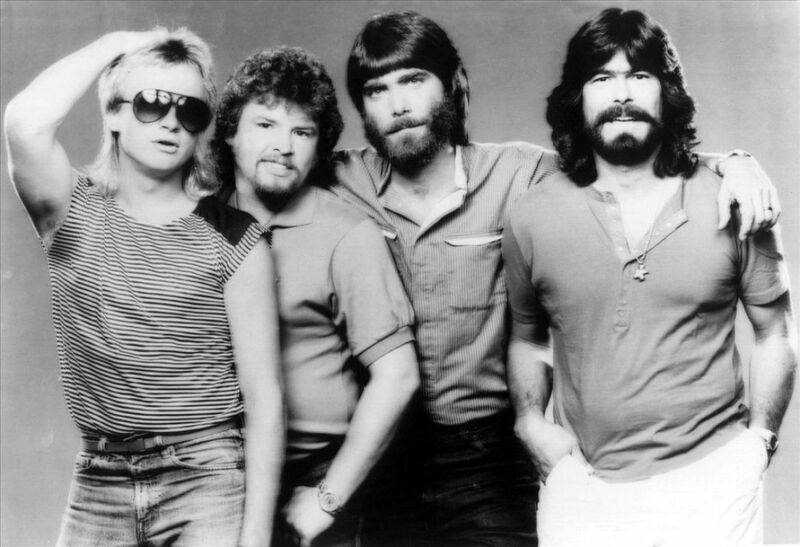 We all discovered that the 1980 country audience was definitely willing to widen the boundaries of country music and Alabama found a pathway to success by blending country/southern themes with an edgier, rock-influenced sound coupled with a high energy stage presentation. A combination of talent and timing transformed them into a legendary country act. My fear is that if they alter their sound and dumb down their songs in order to gain acceptance to the shallow cesspool that is labeled as country music today it will be a very sad postscript to their otherwise stellar legacy. Let’s hope that does not happen. I look forward to revisiting Alabama’s vast catalog all this month. Nice selection. I’m surprised they haven’t been the spotlight artist of the month before this. While I was never a huge fan, I do enjoy a good number of their songs and I actually just recently completed my digital collection of their discography. It looks like they had 3 hits that peaked at #4, not two. The source is wikipedia which is not always an accurate source, however.